A study published recently by a team of researchers, alumni and students from the University of Hawai'i at Manoa School of Ocean and Earth Science and Technology (SOEST) showed that local impacts of humans—nutrient pollution from activities on land—may accelerate the negative impacts of global ocean acidification on coral reefs. Coral reefs provide critical ecosystem services including food security and shoreline protection to coastal communities. These services largely depend on the highly complex three-dimensional structure of coral reefs. For coral reefs to thrive, calcifying organisms, such as corals, must build the reef faster than bioeroding organisms and natural dissolution break the reef down. "There is a long history of examining the impacts of nutrient pollution and ocean acidification on coral reefs," said lead author Nyssa Silbiger, assistant professor at California State University, Northridge and alumna of the UH Manoa Hawai'i Institute of Marine Biology (HIMB) at SOEST. "However, little is known about how these two stressors interact and influence coral reef ecosystem functioning." Prior research showed that stressors associated with human-derived carbon dioxide (CO2) emissions, such as ocean acidification, are shifting coral reefs towards net loss, which would lead to the loss of the three-dimensional framework in the future. The new study in Proceedings of the Royal Society B: Biological Sciences showed that nutrient pollution could make coral reefs more vulnerable to ocean acidification and accelerate the predicted shift from net growth to overall loss. 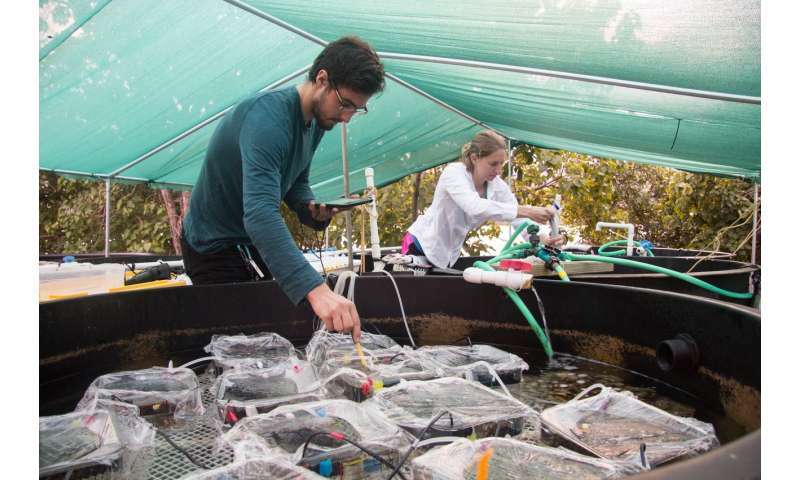 At HIMB, the team used a state-of-the-art system in which they continuously added nutrients (nitrate and phosphate) to aquariums housing different members of the coral reef community, including corals, seaweeds, dead reef rubble, or sand. They then compared this with an experiment mimicking natural systems with a mixed community containing all four constituents and measured critical "ecosystem functions" of coral reef communities: calcification, dissolution, photosynthesis, and respiration. "We showed that nutrient pollution decreases overall reef growth and disrupts the natural chemical dynamics on coral reefs," said Silbiger. "In nutrient polluted seawater, calcifiers were less able to capitalize on the dissolved compounds that make up the building blocks of coral reefs. Nutrient pollution reduced calcification rates—a measure of how quickly reef builders are creating the skeletal framework—nearly tenfold in waters that would otherwise promote reef growth, and enhanced both skeletal dissolution and the growth of seaweed competitors." Nutrients from fertilizers are often thought to impact reefs indirectly, for example by giving an advantage to weedy seaweeds that can overtake reefs, an observation reinforced by this study. "These 'phase shifts' to algal reefs are occurring globally, causing a major change in how reefs function," said co-author Craig Nelson, faculty at UH Manoa in Oceanography and Sea Grant. "But until now we never quantified how nutrient pollution can directly reduce corals' ability to build reef structure." 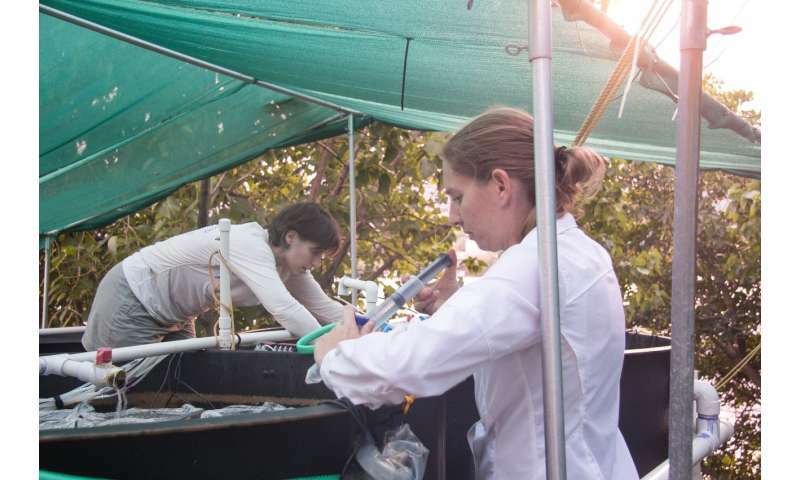 What this work revealed is that the nutrients also change the local pH environment by compromising how corals and other reef organisms breathe, which influences the chemistry of the reef. 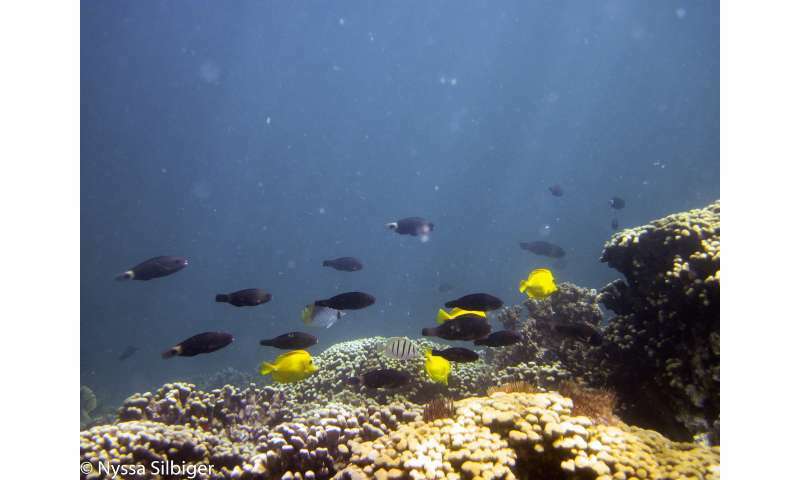 "The relationship between nutrients and reef metabolism exacerbates pH change, which can make the whole system more susceptible to global threats such as ocean acidification," said co-author Hollie Putnam, assistant professor at University of Rhode Island and alumna of HIMB. "Nutrient pollution negatively effects reef growth both directly and indirectly, creating a double whammy for coral reefs already stressed by ocean acidification around the world," said co-author Megan Donahue, researcher at HIMB. "Our data indicate that both local management efforts such as reducing nutrient run-off and seepage into groundwater, and global actions, such as reducing global carbon dioxide emissions, are required to protect reefs from rapidly declining." In the future, the research team will focus on how other reef constituents such as fishes interact with these processes to impact coral reef ecosystem functioning, because reefs are complex networks and these interactions are critical to resilience.